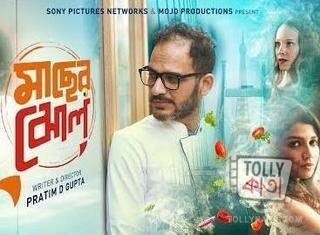 Maacher Jhol is a Bengali Movie of 2017 directed by Pratim D Gupta starring Ritwick Chakraborty, Paoli Dam, Sauraseni Mitra, Mamata Shankar and others. Maacher Jhol Bengali Movie Review 2017. The core exchange between the mother and son duo of Maacher Jhol is much like the audience and the film in question. The mother, played beautifully by Mamata Shankar is never happy with what the prodigal son, famous Chef Dev D cooks for her – the quintessential fish curry. She complains there is something amiss about it. 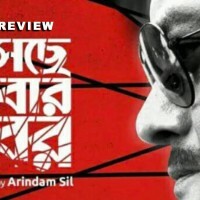 Pratim D too creates an experience that resonates with the Bengali flavour filled with a few moments that tug at the heart – but as you gulp the fare down, you end up feeling the lack of a certain essence that elevates a film from being good to great. However, unlike Dev D who gets the cinematic liberty of multiple chances till he masters the recipe born from his own system, Pratim D unfortunately has to be content with one chance only to cook his dish – leaving him without any option of bettering his spread. Tollywood is in a tussle about content. On the one hand we have the ‘masala’ films that die in a day and on the other, there are some filmmakers who are making an attempt to revive story telling. Pratim D Gupta definitely falls in the latter category with his sensibility and aesthetics. But if a film is defined by what its not – Maacher Jhol is neither loud nor frivolous like mainstream Bengali films – does it become different and better? I don’t think so. Maacher Jhol is a sweet film with the deeper, complicated layers not fully explored. It has all the elements of a typical family drama – a dictatorial father, a sacrificing mother, an obedient but rebellious son, a failed marriage, the son’s success story from being a reluctant engineer to world renowned chef, extra marital affairs, a son’s return home, his subsequent tryst with the people around him and the final.....wait! With all the fine ingredients in place the climactic stages of the jhol or curry is as bland as a vegetarian clear soup. I am not sure if this is how the filmmaker wanted to portray his main character Dev D – but he does come across as an interesting study. An extremely selfish man, he is most concerned about his own ambition and career putting all his loved ones at stake. The way he treats his wife and girl friend makes him a regressive personality who is good at escaping the responsibility of relationships. However, if the maacher jhol is put as a catalyst for redemption and deeper understanding – it fails to do so. There are three exchanges in the film that are executed brilliantly. One – when Dev D tells his mother about her condition. This moment is powerful and sensitive at the same time. Two – Dev D’s confrontation with his father is as comical as it is tragic. Three – when Sreela, his wife played by Paoli Dam, shows the mirror to his true nature. Applause. 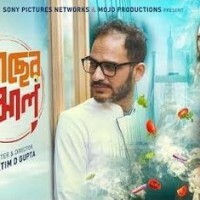 With reference to performances, this is a great time for actors like Ritwick Chakraborty who are marvellous at their craft. However, does he fit the role of a super star chef? I would say no. Mamata Shankar is stunning and is the ideal representative of the Mother. Paoli looks beautiful and does justice to her character who is forced to detach herself from the situation she finds herself in. As a newcomer, Suaraseni gives us a glimpse of what she is capable of. This is Pratim D Gupta’s third film and he has shown us the range with which he can work. He is a young filmmaker to look forward to in future. In the end, Maacher Jhol is not as flavoursome as a fish curry but it is as sweet as a “pithe” leaving one with a feel good factor.